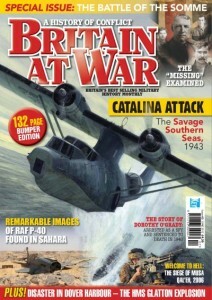 One of the journalists was Martin Mace from ‘Britain at War’ magazine. June’s edition of the magazine includes a 30 page pullout special on the Missing of the Somme which includes a five page article on underground warfare at La Boisselle and our group’s work. There is also an article entitled ‘The Worst of the Worst’ (referring to casualties sustained on the 1st July 1916) focussing on the 34th Division’s attack at La Boisselle. During the archaeological excavations of May 2012 two sets of human remains were uncovered near the south-eastern corner of the ‘Granathof’, the ruins of an old courtyard farm that before the war had long been present at the site. 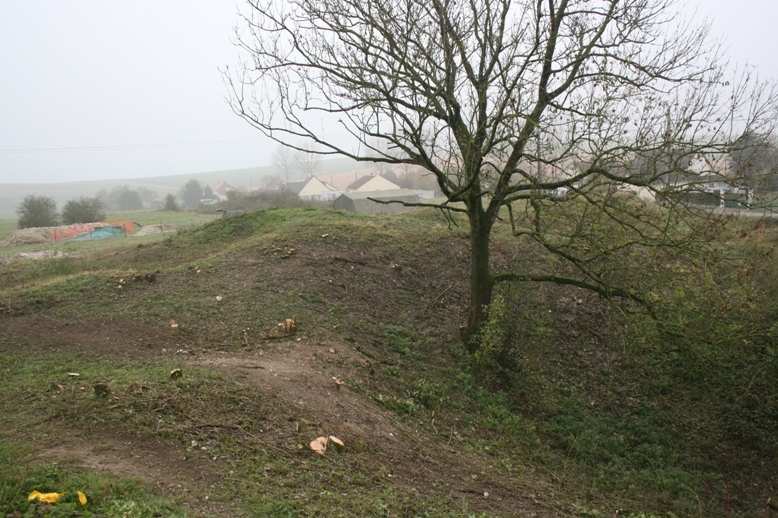 Whilst most of the farm is now a crater field, early surveys suggested that a substantial portion of this highly symbolic structure might still survive, protected by the fallout from mine explosions (see separate section on the Ilot/Granathof). Granathof - an early French trench driven through the stable block. The brick stable floor is evident. Both sets of human remains were uncovered in this area. The first set of remains was found near an early trench that had been driven through the stable block; unfortunately this man was unidentifiable. The small collection of bones was carefully excavated and removed by a qualified archaeologist. 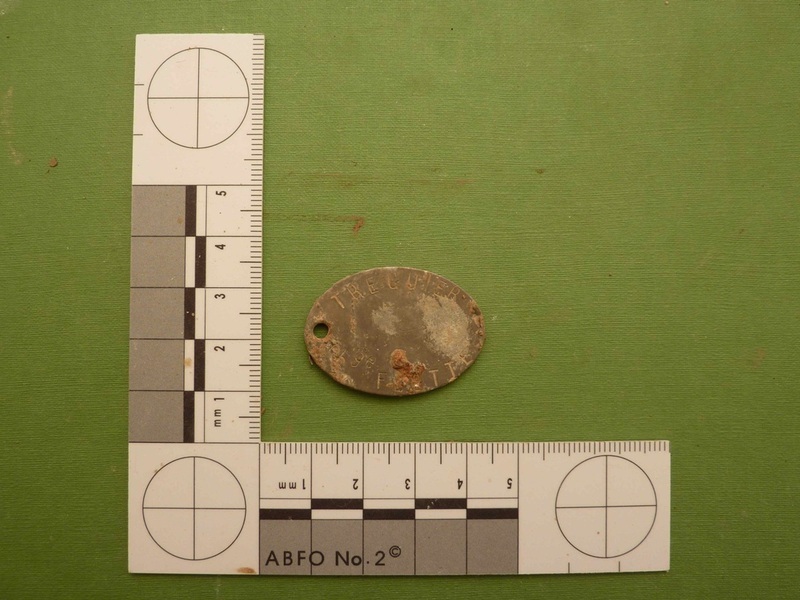 No identifying artefacts, other than French line regiment buttons, were found with the remains. The second soldier was found by Peter Barton during work on the walls of the adjacent farmhouse. There was present an 1881-model identity disc which carried the name ‘BIDEAU’. 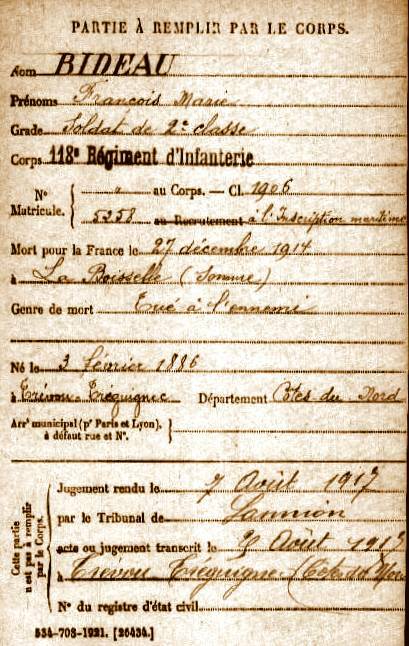 The following casualty form confirms his name as François Marie Bideau of the 118th Infantry Regiment, killed at La Boisselle on 27 December 1914. The disc also bears his call-up year and recruiting region, with the regimental number on the reverse side. The region is Tréguier, a port in Brittany. 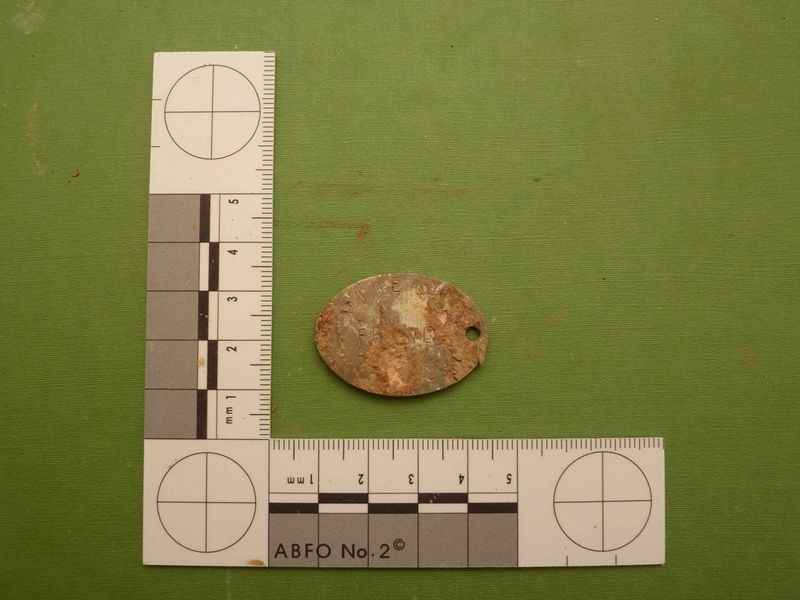 Found alongside were buttons, a toothbrush and small pieces of leather – possibly from personal equipment. It required five days to complete the exhumation. 1881-model identity disc carrying the name ‘BIDEAU’. Parts are corroded. The reverse side bears his recruiting region, Tréguier, a port in Brittany. The War Diaries of the French 118th Infantry Regiment and 11th Army Corps, and also the history of the 13th Wurttemberg Pioneers enable the events of 27 December to be pieced together. After the loss of the farm on Christmas Eve, the Germans tried to retake the position on 27th with a grenade attack by infantry and pioneers. Determined to hold the line, the French had amassed a large amount of artillery. The farm buildings were at this time held by the 3rd Company of the 118th Regiment commanded by Lieutenant de Castel. After a heavy bombardment by trench mortars, the Germans advanced from their trenches some 60 metres away with fixed bayonets. According to the war diary of the 118th Regiment, the Germans came forward with right hands raised, signifying surrender, until nearing the French some amongst their ranks threw melinite bombs. The attack was repulsed at bayonet point, but was followed by another heavy German bombardment, which itself preceded another grenade attack half an hour later. 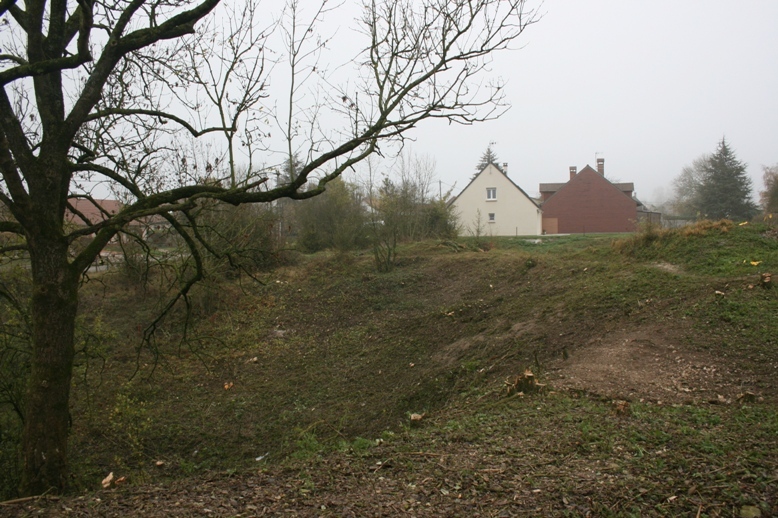 The French then bombarded La Boisselle and the German artillery batteries, reporting that this fire combined with that of the infantry defeated the assault. De Castel’s Company was now very tired, having held the position for three days. It was therefore relieved by a company of the 65th Regiment later in the day. Sandbags, logs, improvised grenades and coils of wire known as ‘réseaux Brun’ were brought up to reinforce the farm. The German fire gradually lessened and by the end of the day quietened down. Losses to the 118th were one officer wounded and approximately forty casualties to other ranks. Amongst the German casualties were two pioneer officers killed. Several coils of wire were recovered during the excavation. Soon after the discovery of the remains of François Bideau, Claudie Llewellyn-Lejeune, one of the Glory Hole’s proprietors, made contact with the family in Brittany and also the Mairie of the soldier’s home town. 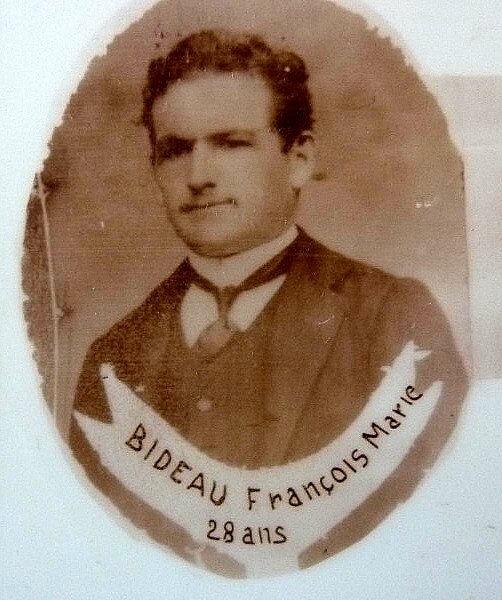 François Bideau’s son served in the Second World War; he was killed in 1940. Other family members are in the process of being traced. Further information will appear as soon as it becomes available. We began work on Monday 30 April, erecting two new tents to be used for storing archaeological finds and to act as a workshop. Further clearance work continued at the foot of X Incline (1915). Our main focus has been on a larger sondage between X Incline, the Granathof back towards W Adit. Topsoil was removed over a 50m x 30m area encompassing W Incline, Scone Street and Quémart Street. This process revealed clearly the outline of trenches. Work has begun on opening a section of Scone Street as well as clearing around the covered entrance to W Incline. 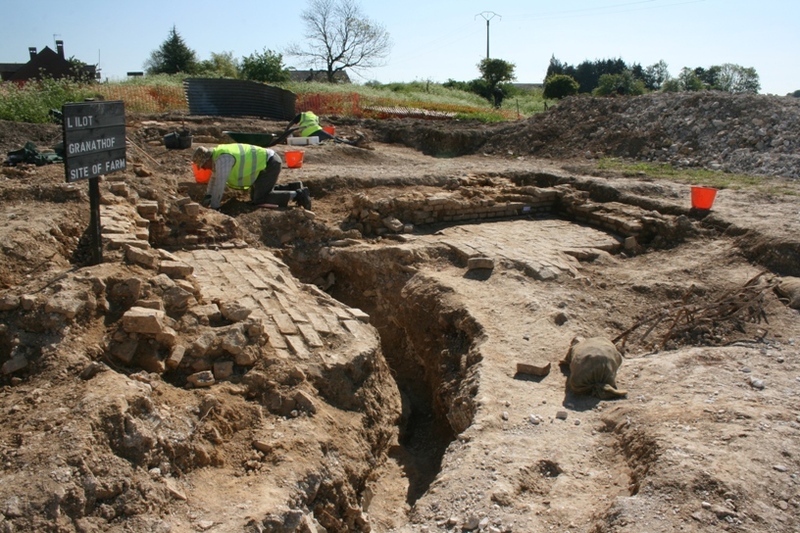 A concerted effort began on uncovering what we believed was a surviving corner of the Granathof farm. 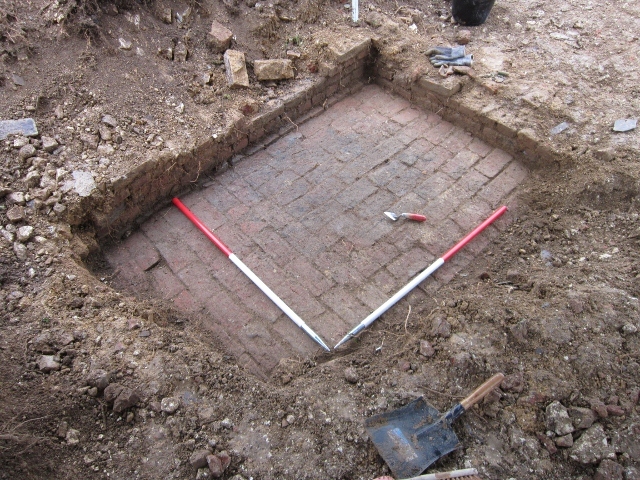 Results have been spectacular with walls and a brick floor of the stable block uncovered. Using French maps sourced from archival research we have discovered one of the first trenches, dug through the stable block to the forward French trench. Many artefacts including large quantities of French and German small arms ammunition have been found at this spot. Our efforts underground have been equally rewarding. 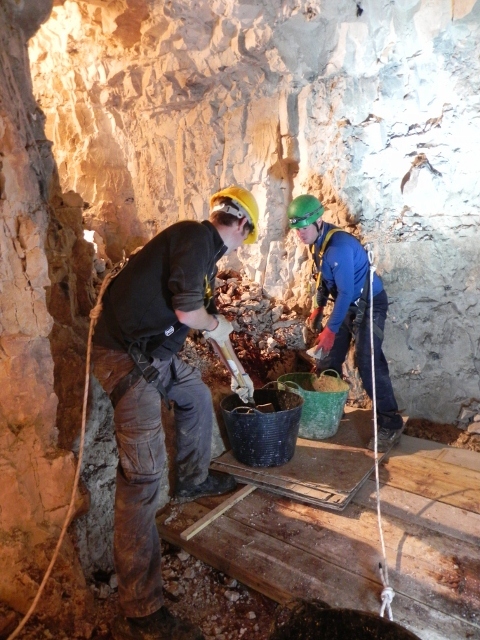 Over the first week we have cleared an estimated 40 metric tonnes of chalk spoil from W Shaft chamber. 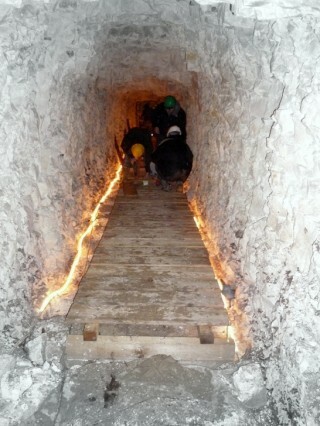 The duckboard floor laid on W Adit has been extended further. Working in Petzl harnesses under strict safety requirements we have cleared the spoil from around the 50ft vertical W Shaft. As this will be our main access point into the underground system we have endeavoured to make this area as safe as possible. Using the expertise of key sponsor, Danny Gunner a bespoke steel safety cage has been built which which sits over the shaft. Bolted and welded together, there is now a secure area with steel mesh floor in which to work from. Work will continue this week installing electric winches and a safety cage in which to stand under when at the shaft foot. 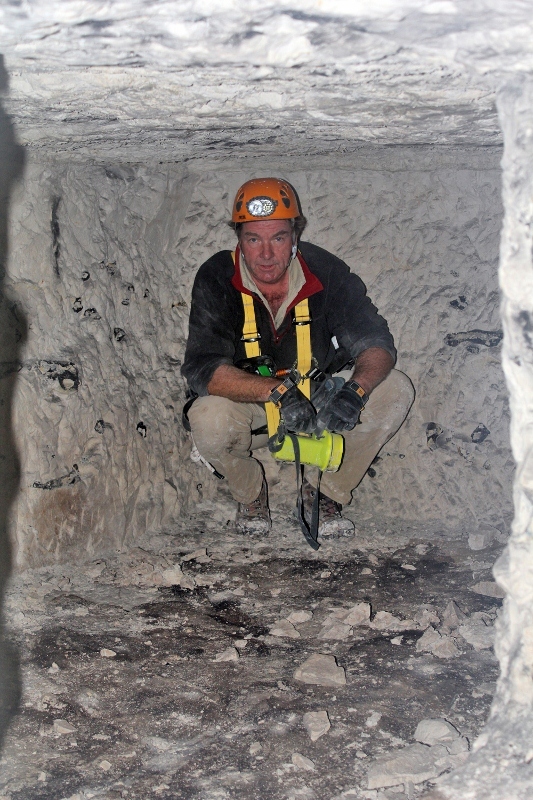 We will also begin the delicate process of assessing the integrity of the vertical shaft walls and, if safe to do so, clearing up to 12 feet of spoil from the shaft foot. 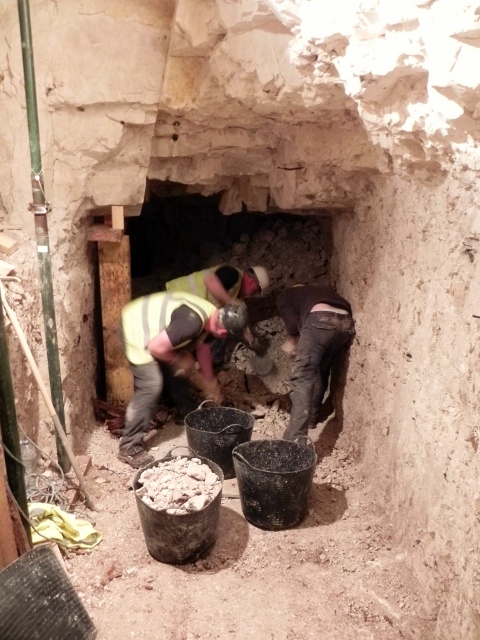 Spoil clearance in W Shaft Chamber. Over 40 metric tonnes have been removed this week. Clearing spoil from area around W Shaft. 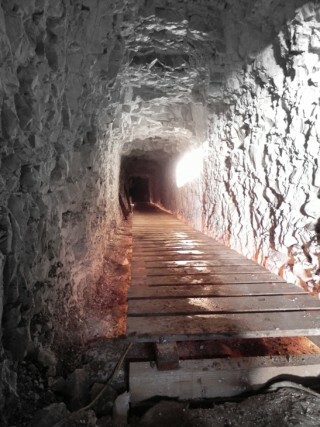 Steel beams and timbers cover the 50 ft shaft. We have welcomed hundreds of visitors. Many have been very generous in leaving donations. We would like to thank them for their help and for those who have donated via PayPal. If you are interested in helping us financially then please visit the Donate page. Our public thanks to the dedicated volunteers who have given up their time to help us with our work. Further thanks to Phil Giles from Pan 3Sixty who has been with us from the start, taking panoramic images above and below ground. These will be made freely available via our website. We will be joined by Meridian TV on 16 May who are filming for an extended news piece to be broadcast later that day. 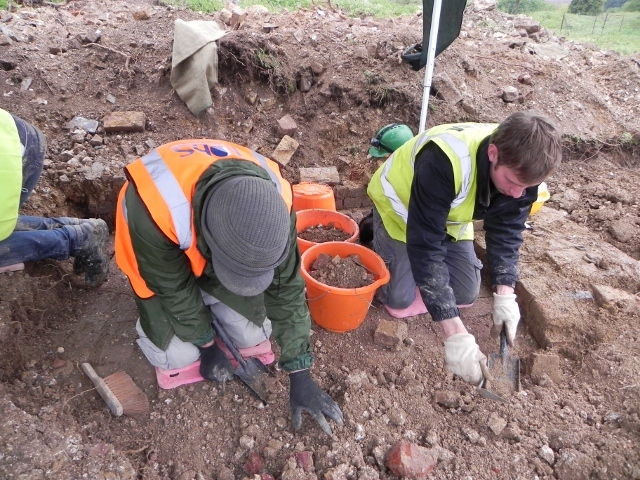 A full report of the archaeological work will be made available via the website upon completion of the dig. 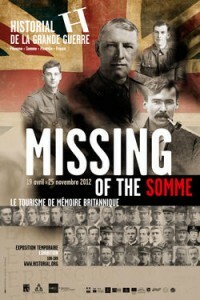 If you are planning on visiting the Somme battlefields before 16 May then please come and visit us. Looking vertically down W Shaft. 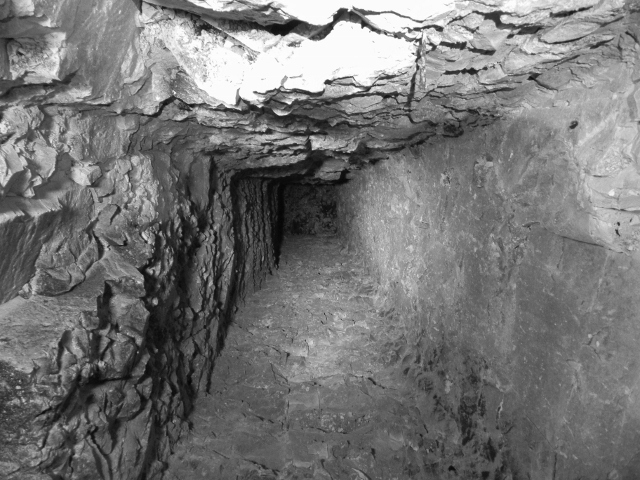 Approximately 12 feet of spoil needs clearing from the foot before access can be gained into the lateral tunnel. 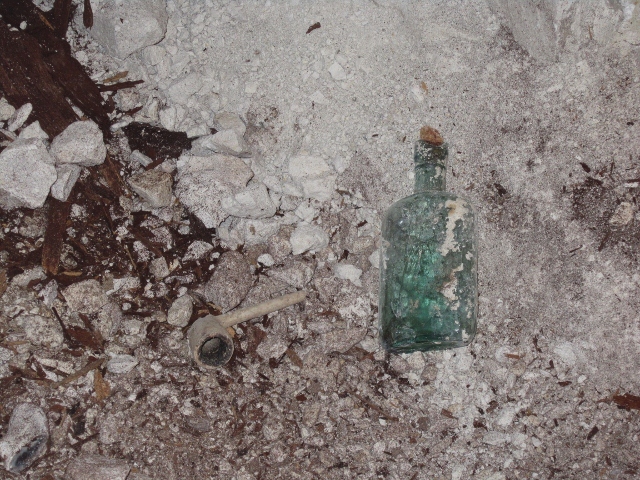 Clay pipe and corked glass bottle containing a small drop of rum. 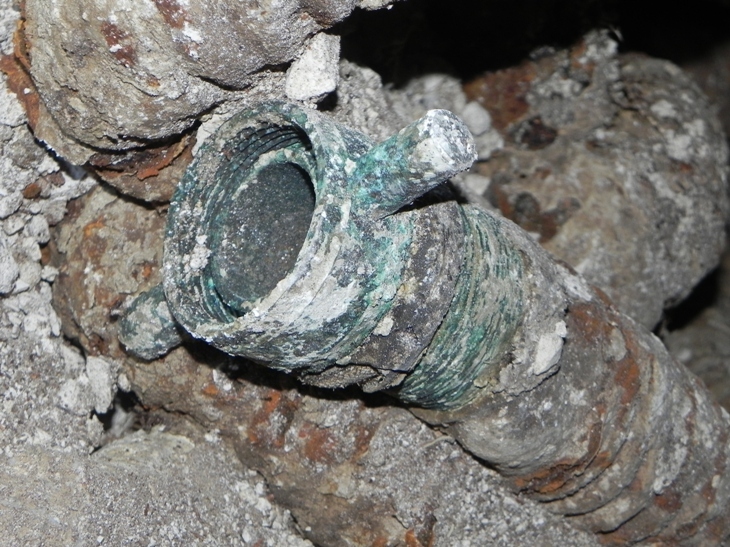 Both items, in a remarkable state of preservation were found in W Shaft chamber. 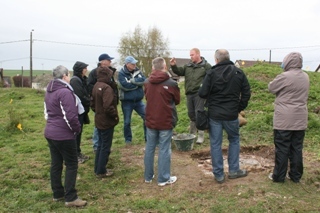 Despite poor weather our open day on 10 April was very well attended. It is estimated that there were at least three hundred visitors, many of whom had travelled from the Netherlands. We also noticed visitors from the UK, Germany, Belgium and Australia. We would like to thank all of those who visited and made a donation towards the continuance of our work. 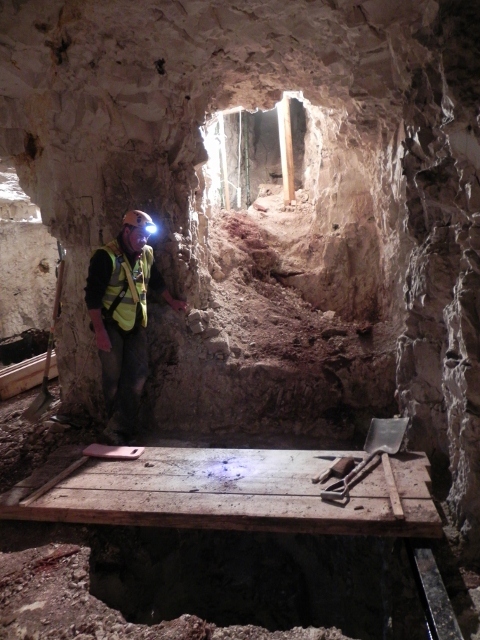 The site will be open to visitors during May’s working period. 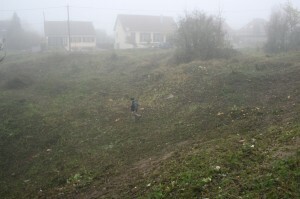 Please see http://www.laboisselleproject.com/access-open-days/for further details. We look forward to welcoming you on site then. The team spent two days on site in early March. Some of this time was given over to media commitments which included showing Frank Barrett, a journalist from the Mail on Sunday around the site, as well as filming a short piece with a crew from Channel 5’s ‘Live with Gabby’ daytime show. The results can be seen here: http://www.laboisselleproject.com/2012/03/18/recent-media-coverage-for-the-project/. Our primary task, however, was to inspect and survey parts of W Shaft chamber in order to determine dimensions for the planned steel safety cage which will be specially fabricated to sit over the W Shaft. We were joined by one of our key colleagues Danny Gunner who is generously sponsoring the fabrication, transport and erection of the structure, as well as safety equipment, winches and lighting, and briefing and training for working in confined spaces. Over the past 95 years small falls from the roof have altered the chamber’s shape so it now resembles that of a bell. The logistics of designing and installing a rectangular steel frame into this irregular shape was discussed in detail. The dimensions of W Shaft were re-confirmed (1.8m square) in order to ascertain the necessary size for the steel collar which will form the base of the cage. The shaft itself was ascertained to have 4 metres of spoil at the bottom. It was also calculated that up to 40 metric tonnes of spoil will need to be removed from the chamber area to allow for archaeology, shoring and bracing to take place. 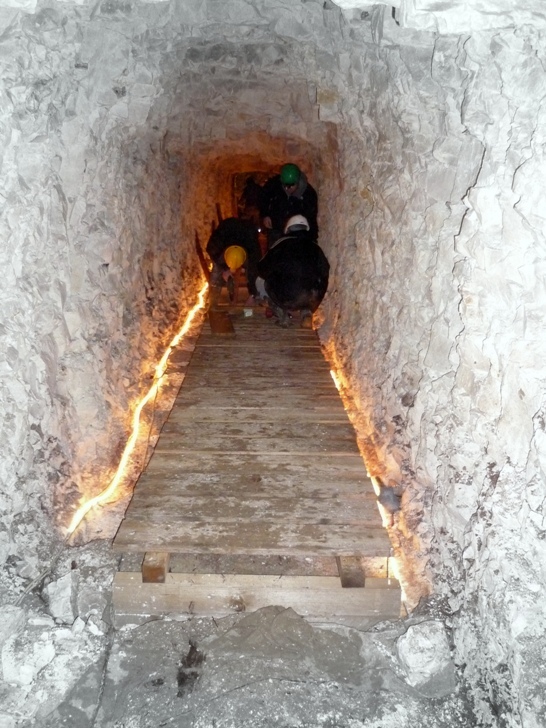 To facilitate the removal of spoil from the chamber, and to protect the original 1916 floor, a wooden duckboard walkway was installed along 30 metres of W Adit. Archaeology was continued at the bottom of the steeper 1915 ‘X Incline’. 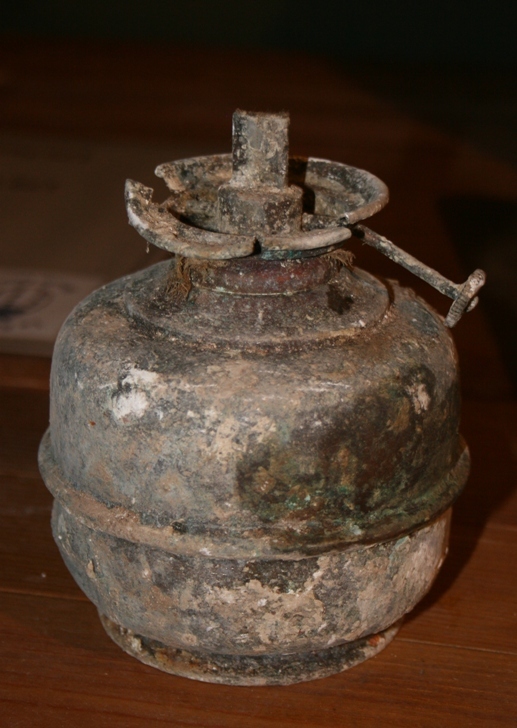 Finds included a well-preserved sandbag wall, a long and intertwined length of steel-reinforced rubber air hose with brass fittings, and an axle with rubberised wheels at each end. When first uncovered we hoped it would be a small miners truck. 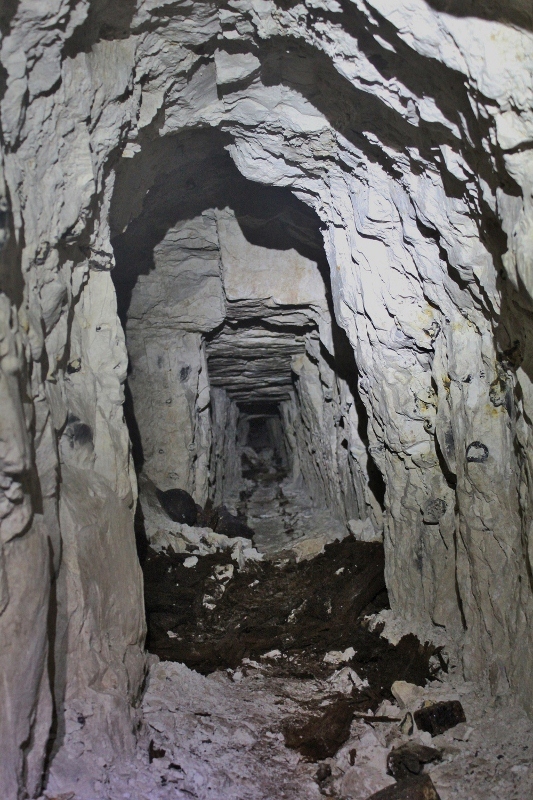 However, as it was excavated it soon became evident that it was too long for use in mine galleries, its length being considerably wider than the tunnels. The base of an oil lamp, a mess tin, and an empty tin of 25 Meadowland cigarettes were also uncovered. Work continues on cleaning, cataloguing and preserving these finds. Further archival study of several surface features was planned. This includes the history of the Ilôt/Granathof prior to the war, the struggle for the farm, detail of a German raid across the craters against 1/7th Black Watch on 4 August 1915 which resulted in the first British prisoner being taken, and two raids on the German lines by the Northumberland Fusiliers in June 1916. We now also have material to illustrate the symbolic 1937 ceremony at the Glory Hole between representatives of the Black Watch and 19thBreton Regiment. When we are next on site there should be much more interpretative material for visitors to enjoy. Archival research in French, British and German records continues. 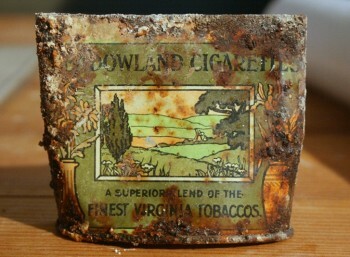 Empty tin of Meadowland cigarettes found at the foot of X Incline. Hidden for over ninety years, they are in a superb condition. 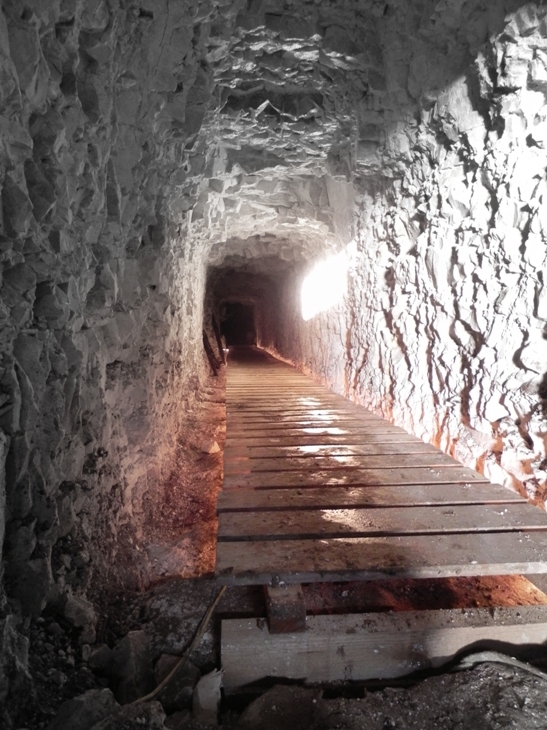 The brass fitting at the end of the intertwined length of steel-reinforced rubber armoured hose found at the foot of X Incline. 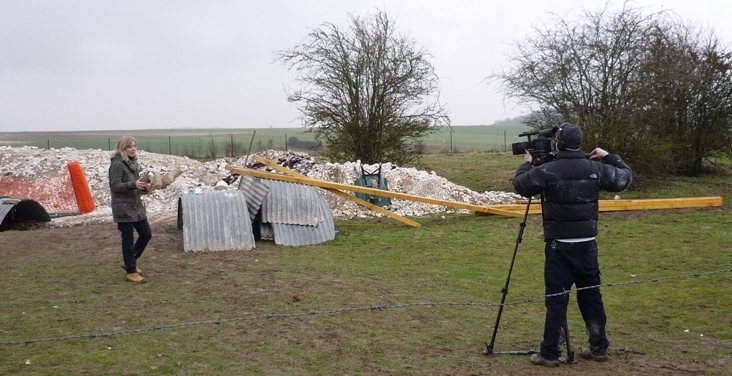 We were joined on site on 5-6 March by a TV crew from Channel 5’s ‘Live with Gabby’ show. Their short film was broadcast on Friday 16 March’s show. It can be viewed for a further five days via this link: http://www.channel5.com/shows/live-with-gabby/episodes/friday-16-march-2. The film starts just after 30 minutes in to the show. 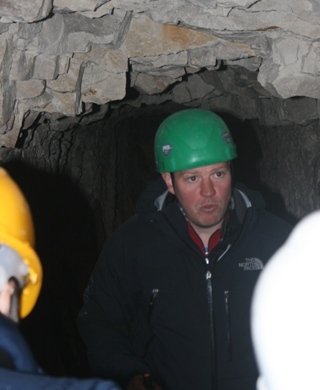 We also showed Frank Barrett, the Mail on Sunday’s travel editor around site and took him underground in W Adit. 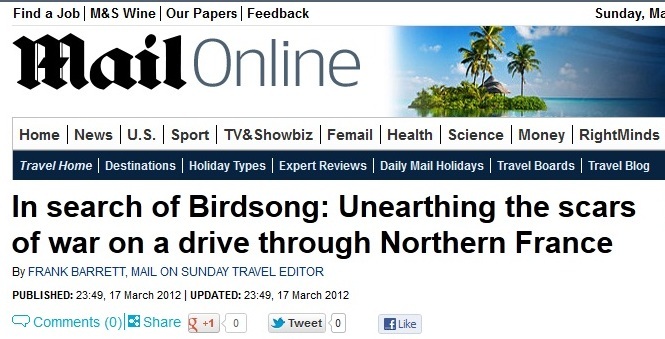 His article, entitled In search of Birdsong: Unearthing the scars of war on a drive through Northern France was published in today’s paper. 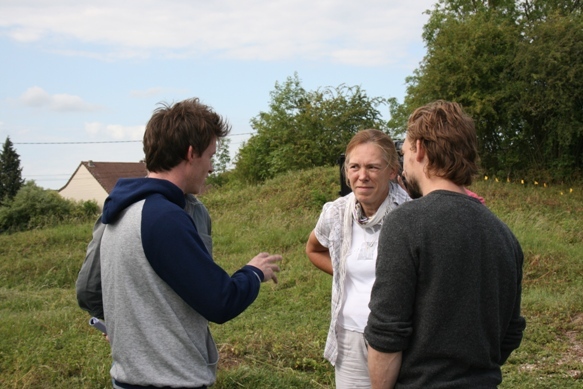 It covers our work at La Boisselle, focussing on last June’s visit to site by Birdsong actors, Eddie Redmayne and Joseph Mawle. Frank’s article can be viewed online by clicking the image below. Our thanks to Ruth Bray and all at Premier PR for organising this. Please note that the newly formed Somme Branch of the Western Front Association are holding a meeting at 1930 hrs on 10 April in the Somme Trench Museum in Albert. Battlefield guide Clive Harris will be speaking on subject close to his heart, ‘Sporting Icons of the Great War’. The Somme branch has kindly agreed to donate all proceeds from the raffle funds to the La Boisselle Study Group. One of the raffle prizes is a signed copy of Arras – The Spring 1917 Offensive in Panoramas including Vimy Ridge and Bullecourt by Peter Barton & Jeremy Banning. At present there are around sixty people who have signed up to attend. However, the branch would welcome more guests. If you are visiting the Glory Hole on 10 April then please consider dropping into the museum for this talk. 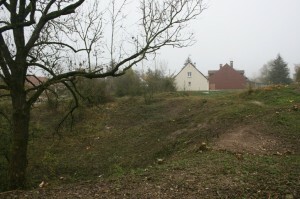 The museum’s website is http://www.somme-trench-museum.co.uk/ and a map of Albert can be found here: http://www.ville-albert.fr/fr/files/plan%20albert-OK.jpg. We look forward to seeing you on site. There will also be Open Days from 30 June – 2 July inclusive to cater for the many battlefield visitors over that period. 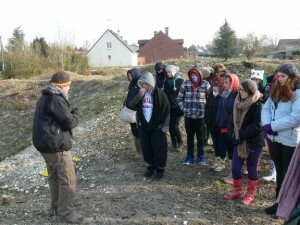 A group of 20 students and two teachers from Farnham Sixth Form College visited the site at the Glory Hole on 8 February. Despite bitterly cold temperatures the group was met and guided by La Boisselle Study Group member Richard Porter. 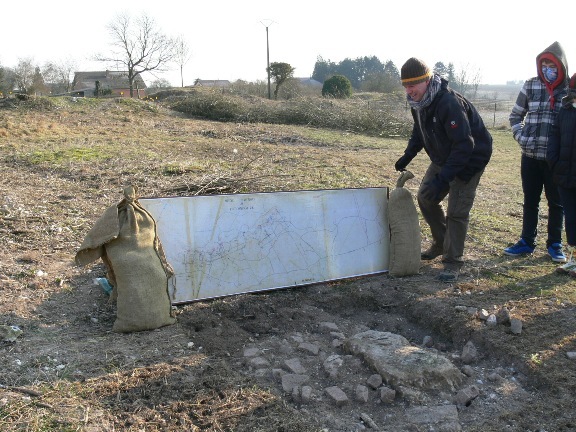 Richard set the scene by pointing out the respective positions above ground of both sides, before giving an explanation of both defensive and offensive military mining in the immediate area from autumn 1914 to the opening day of the Somme offensive in July 1916. 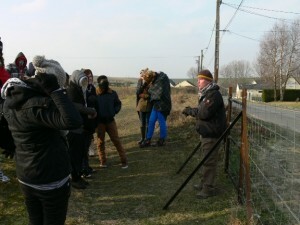 He was also able to show the students some of the artefacts that had been found during October’s archaeological work. Many of the students were studying Birdsong as part of their ‘A’ Level English Literature course, and were fascinated at being taken a short way underground in W Adit to appreciate the work of the tunnellers, see the size of the underground workings and remains of the tramway system that had been installed. 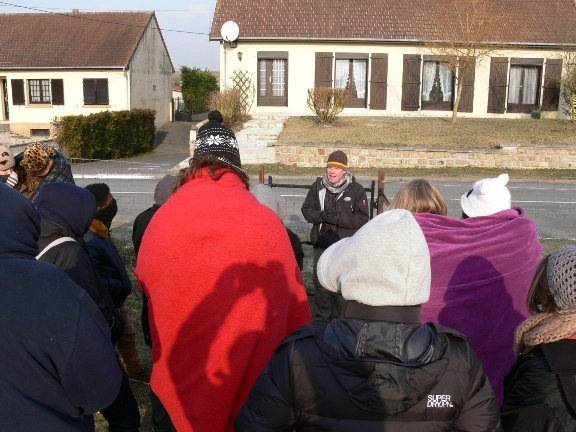 Richard was also able to tell them stories concerning individual RE tunnellers from 179 & 185 Tunnelling Companies operating at the site in 1915 & 1916. Dependent upon existing work commitments we will always endeavour to show parties around the site. Please contact us for details. In June 2011 we were joined on site by Eddie Redmayne and Joseph Mawle, the two actors cast to play Stephen Wraysford and Jack Firebrace in the Working Title adaptation of Sebastian Faulks’ novel ‘Birdsong’, a book which has come to occupy a permanent and celebrated place in First World War fiction. Filming in Hungary was yet to start. 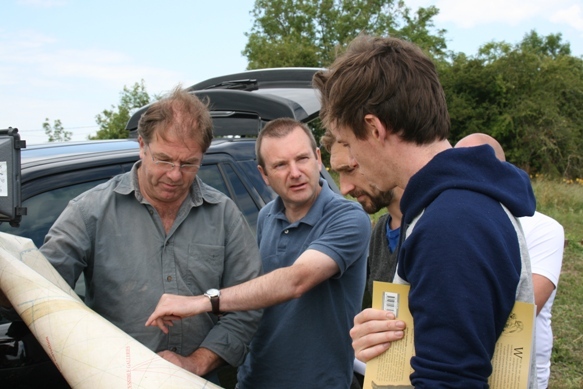 LBSG member Peter Barton was Historical Consultant for the production. 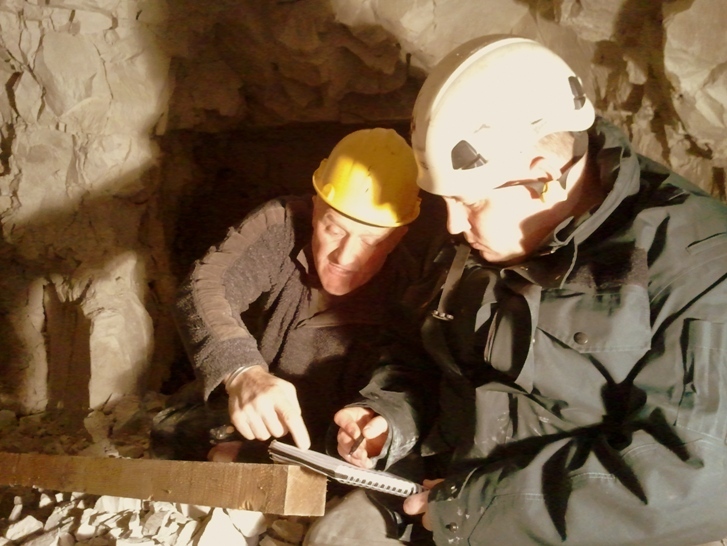 Because much of the film’s action takes place on the Somme battlefields (Beaumont Hamel) he invited the producers to visit La Boisselle to gain an understanding of the environment and conditions faced by tunnellers working beneath the Picardy battlefields. On Eddie and Joseph’s arrival the nature of surface and subterranean warfare at the Glory Hole was explained. We were delighted to show the actors the site and explain some of the difficulties and dangers endured by the tunnellers. 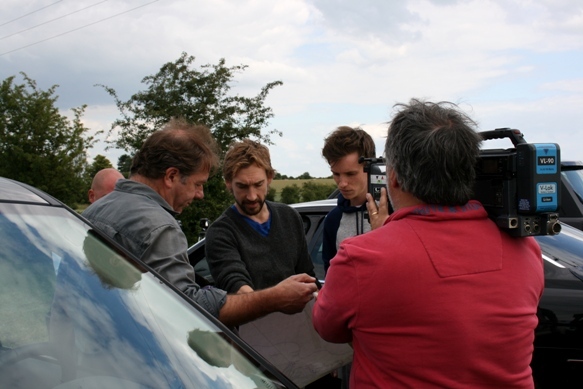 The visit was filmed by LBSG member Mike Fox BSC; some of this footage may appear on the Birdsong DVD. The experience had a powerful influence on both men. In recent interviews Eddie Redmayne revealed that he wrote the poem, which he described as “hope in the most horrific of circumstances”, on the cover of his script as an inspiration for the role, and as a reminder of the tunnellers and their work in the Glory Hole at La Boisselle. 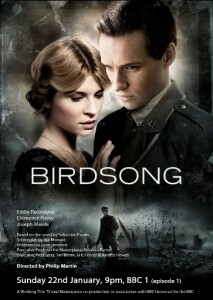 The BBC website for Birdsong is available by clicking the image below. We are grateful to Eddie Redmayne, Joseph Mawle and the production team at Working Title for their permission to divulge this information and reproduce the images. Many thanks to Andy Johnson who sent us a scan of a recent article published in the Black Country Bugle. Entitled Princes End miner killed in German underground blast, it tells of the loss of two Tipton men, Sappers John Lane and Ezekiel Parkes, who were amongst the dead from a German blast on 22 November 1915. Further information about this incident can be found on our dedicated Tunnellers page and in the Black Country Bugle article. It can be read in full by clicking on the image below. 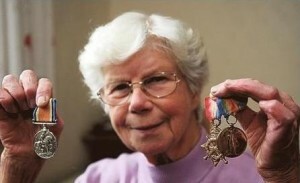 Mrs Gertrude Hillman with the Great War medals of her father, Sapper George Maule. 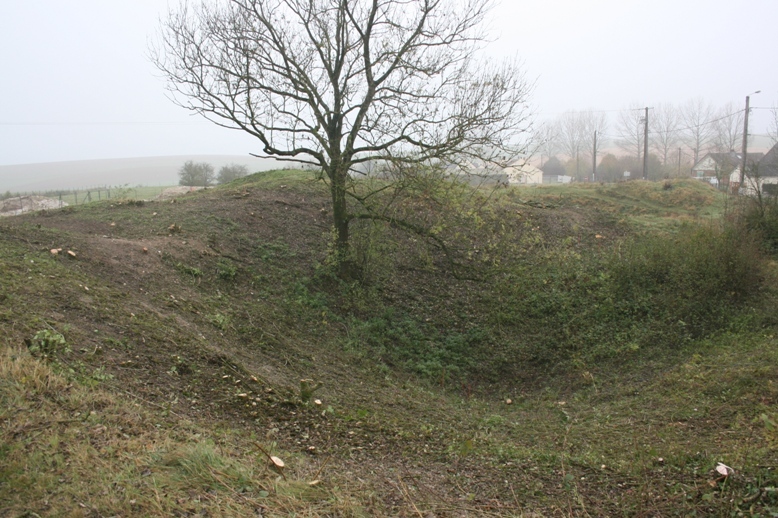 An article appeared in the Somerset Guardian on 10 November entitled Army worked underground which focussed on Sapper George Maule’s wartime service with 179 Tunnelling Company at La Boisselle. 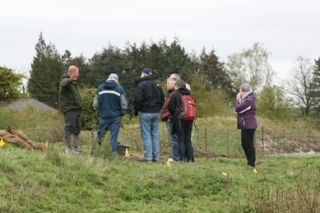 There is a brief mention of our work on site and a comment from George’s nephew, Barry Maule, who visited the site with his wife Sue during our Open Day weekend in October. We have been joined on site this week by regular volunteers and friends. Our focus has been the continued clearance of the larger mine craters. 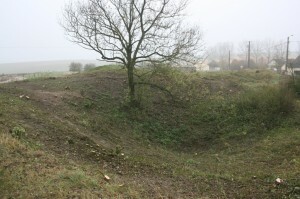 The largest crater on site had already been cleared prior to the October open days. However, the neighbouring crater, sitting nearest to the Contalmaison road has now been cleared. 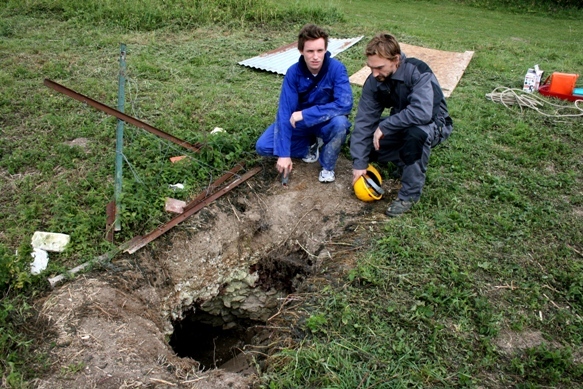 This work is necessary for appreciating not only the size of each mine crater but for investigating the complexity that multiple mine blows had upon the area. Site clearance will continue over the winter months. Please click on images to enlarge. 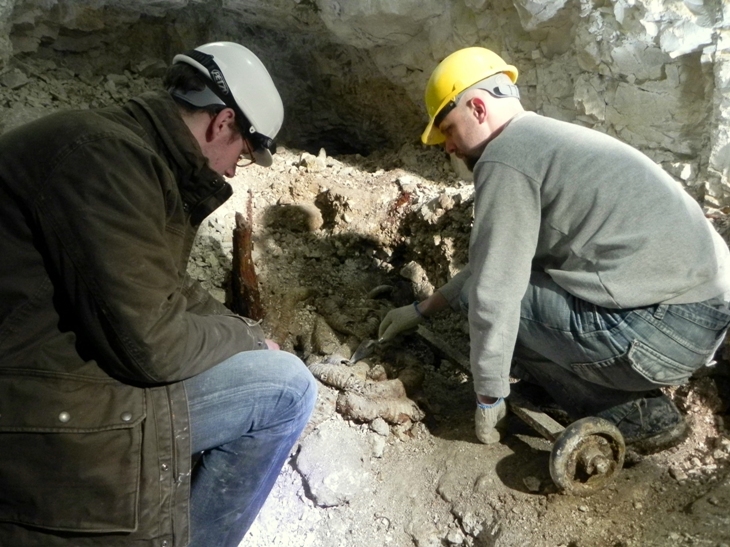 Following the BBC media coverage on 3 November the story of the tunnellers at La Boisselle was picked up by a number of newspapers. 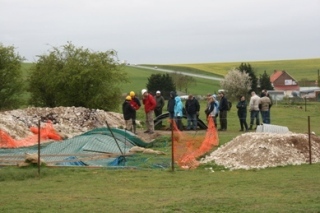 We were also contacted by many people with an interest in the project, including those with relatives who served above and below ground at La Boisselle. Please click on the Newspaper names to read each story.